What would you want to do without? What would you want to do without: electricity, plumbing, sewer/toilet, hot water, refrigeration or heat? Think about it. These are the things that I consider modern conveniences. Oh, sure you can boil water over a fire or warm your home with a woodstove, but it’s not the same as turning a up thermostat. I like to read in bed because it helps put me to sleep. Have you ever tried to read by candlelight or even a flashlight? It’s tough. Then when we redid the bathroom we were without a shower or toilet for almost two weeks. I had to shower at other places and also used buckets and bags to dispose of, uhhm, solid waste. It’s different than just flushing a toilet and saying bye bye. Burning candles or kerosene in of doors is pretty sooty. Heck, running a woodstove is dirty. How about doing without watertight housing? I guess the point is that one way you could look at things is to figure out what would be the hardest thing for you to go without and set your priorities based upon that ordering. If you live in a dry, arid area like parts of the southwest than you probably would move water to the top of your list. Someplace else like Maine or Minnesota well there is copious amounts of water, but planning to stay warm in the winter would have to move pretty near the top of your list. If you live in the North Country and plan to burn wood to stay warm you best be chopping wood ten hours a week for every week during the summer. Believe me planning to stay in a tent for an extended period during the winter isn’t really a plan. So have a plan to stay warm, stay dry, light your place, dispose of waste, boil water, do your laundry, stay cool and have potable water. Think about what you may miss the most and apply a solution to that contingency. Imagine if the power goes out for a week or the municipal water treatment plant goes down. Consider having redundant systems in place for vital resources such as potable water. 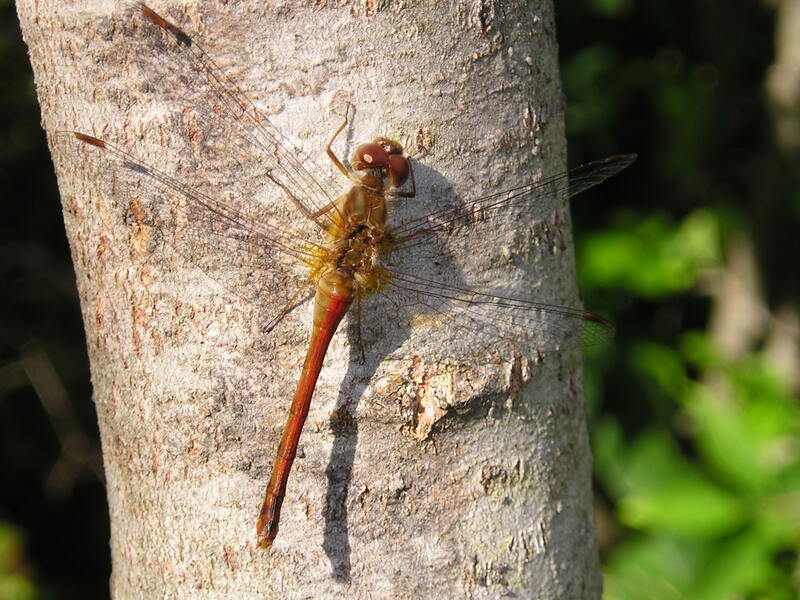 I saw a dragonfly on a tree so I took a picture of it. I like the yellow on its wings. These things are like the jet fighters of the insect kingdom. If you don’t spend any time outside then you may not know that this is a blaze. 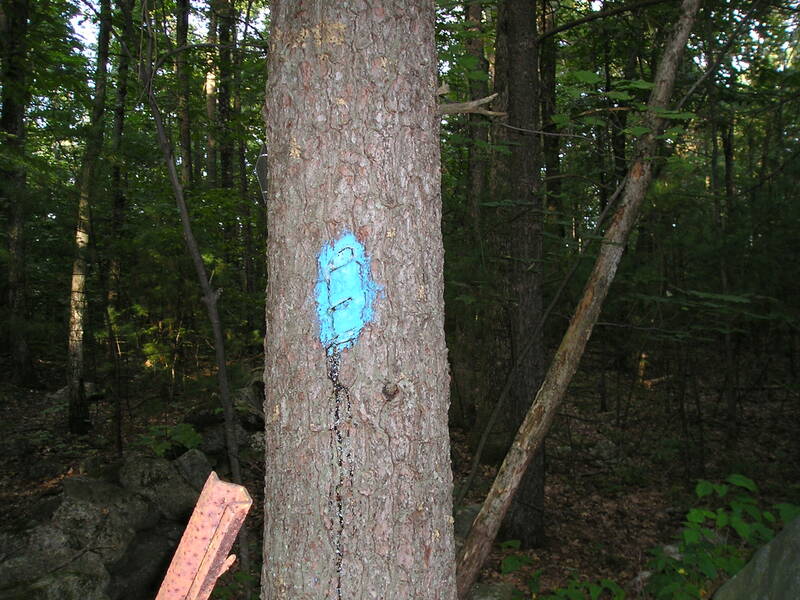 This is how trails are marked. This is the blue dot trail. As you’re walking along a trail like the blue dot trail you keep looking for blue dots on trees or rocks and that’s how you plot your way. Blazes come in all different colors and shapes. There can be the red dash, yellow dot or the blue dot dash trail. This entry was posted on September 18, 2009 at 12:50 am and is filed under Preparations, Risk/Return, Skills, survival. You can follow any responses to this entry through the RSS 2.0 feed. You can leave a response, or trackback from your own site. Potable Water. Rain water can be used to bath or wash dishes, water from swimming pool or even the ditch can be used to flush toilet, but potable water is necessary. In an emergency I know I can catch rainwater, purify and filter it to use for drinking and cooking but it takes time and if that’s the case, we have other more important thngs to do. That’s why we keep at least 2 gallons stored on hand at all times. We fill up if a storm/hurricane threatens. Bellen if you don’t get rain every day or there isn’t a river/stream/pond you should multiply your water storage by 100. Very well said. Thanks for the work you put into your blog. Since i live in Florida, it an easy choice to give up heat. We only have about 3-4 nights a year when the temp drops below freezing, and every day warms up to at least the 60’s. However when I was younger and farther north, we did not have electricity, plumbing, sewer/toilet, hot water, refrigeration or heat (only a wood stove). And in a northern climate, I’d give up the sewer/toilet and just go with an outhouse or sawdust toilet. interesting to prioritize like this. I love int he northeast so heat and food would be high on the list (we’re sort of used to the dark so we can live with that). water could be tough when everything freezes solid though. nice article, got me thinking. I’ll give it all up. The reason? No bills. No wage slavery. Freedom…. But the wife and kids don’t exactly see it the way I do….. The minimum is being able to have potable water from the faucet. The others are important, but having no water for drinking or washing for an extended period of time would make life difficult.